I have been a photographer for over 15 years with the privilege of working in Los Angeles, Downtown LA, Hollywood, Beverly Hills, and surrounding neighborhoods. 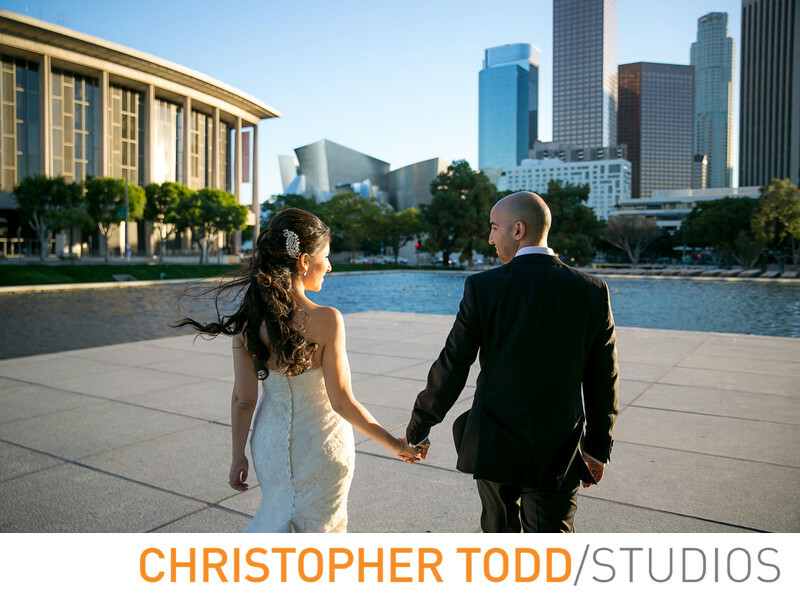 Engaged Couples who choose Downtown Los Angeles for engagement photos are looking for a sophisticated, urban, environment. You will love photos at the Disney Concert Hall, The Department of Water and Power, and the many museum like LACMA, The Broad, and Petersen Automotive Museum. These are just a few to see a full list visit us here. Near Downtown Los Angeles you will find more engagement spots like the Santa Monica Pier, and Venice Beach. Abbott & Kinney is one of my favorite streets to photograph a couple. Our photography studio is located in Orange County just 45 minutes from LA's iconic buildings and landmarks. It is important to keep in mind that some locations like Descanso Gardens requires a permit to have professional photos taken here. We can help you get the proper permits to the Downtown LA locations that require one. Don't pass on your professional engagement photos. We know how busy couples are and planning a wedding is very time intensive. Engagement photos are so important for many reasons. One being it is a perfect opportunity to see your wedding photographer in action. At the same time I get to know you better and all your likes and dislikes. It prepares you for your wedding day photos in so many ways. Working together before your wedding is one of the best ways to get amazing photos. Your engagement photos can be made into a beautiful priceless custom album to begin the legacy of your love. Generations will see these photos and know what their parents and grandparents looked like before they got married and the love that they share. If you are planning a multiple location engagement session please keep in mind the time that it takes to get from one location to the other. This will limit the amount of time we have to take photos. Having a plan prior to the session will optimize our time together for the best engagement photos. We always recommend a style guide for couples. Getting your hair and makeup done by your vendor is a great way to look good for your photo shoot and doubles as a trial run for your wedding. If you need help deciding on a location we are here to help with suggestions. Our style guide can help you look and feel your best for stunning photos. Connect with us today. Fill Out Our Connect Form To Get Started!